The Slow Dancer Who Spun Platinum. with help from a disco hit called "Lowdown,"
The Slow Dancer is on the move. (Original transcription from the files of Boz Friend Susan). This interview was published on February 24, 1977. The interview had been conducted during the previous holiday season and the concerts described here took place just before and on New Year's Eve, 1976. Oakland: The Grand Lobby was packed with beautiful; or at least beautifully dressed; people. It was intermission on the fourth of five sold-out shows at the Paramount Theater of the Arts, this restored, 2998-seat art-deco movie palace of the Thirties where Boz Scaggs and his series of New Year's concerts have become a holiday tradition. Many of the people here were regulars; they knew their way around the Paramount, upstairs to the mezzanine, downstairs to the champagne bar and the lavish, modern dressing room and johns. But there must've been a lot of new customers as well, helping close out a year in which Boz Scaggs, finally, became more than a local star. Silk Degrees, his latest album, went double platinum (2 million sales) and hit the Top Three, with only the likes of Wonder, Fleetwood Mac, and Frampton keeping it from the top. And it got him several Grammy nominations, including Album of the Year, Best Pop Vocal Performance and even Best R&B Song, for "Lowdown." 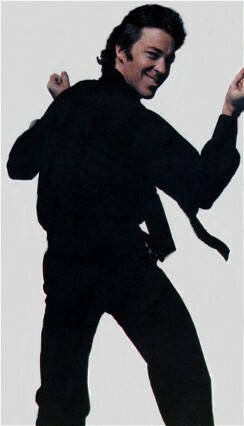 That number was one of three hits from the album (the others were "It's Over" and "What Can I Say"). 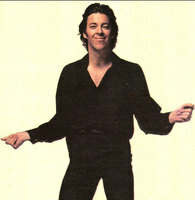 There was a time last September when "Lowdown" was in the Top Five on both the pop and soul charts, and Scaggs was a certified disco item. So Scaggs optimistically extended his usual three-night Paramount run to four. When those shows sold out in a few hours, he hastily added a fifth. Now, intermission was billowing to a close in the Paramount's monumental lobby. A couple of minutes later a rock rhythm section began playing on the stage, and Boz strode out, all in white from Capezios to silk shirt, grinning to the applause like the favorite entering the ring for a championship bout; another curtain rose to reveal a 20-piece string orchestra plus two trumpets, three saxophones and a trombone, all against a strawberry pink backdrop. And Boz, microphone in hand, was singing "Lowdown." The guitar that had once seemed part of him was resting on a rack. He was working the forestage, in fact, like a James Brown or a Tom Jones; even to the undone top two buttons of the white silk shirt. A girl jumped up on the stage and handed him a rose, which Boz accepted almost bashfully and then threw into the audience. The audience was seeing essentially the same set Boz had taken across the country last spring and summer, mostly songs from Silk Degrees and its immediate predecessor, Slow Dancer, only grander using live strings where the tour had made do with a synthesizer, a larger horn section and an augmented female chorus. In the three-woman chorus a singer named Rebecca Lewis was dancing up a ministorm and galvanizing the stage with a personification of the magnetic feminine presence all Boz's songs imply. The audience was on its feet for an encore even before the curtains had started to close. Boz introduced some of the musicians; guitarist Les Dudek, a sizzler from Macon, Georgia, and Tom Salisbury, who arranged the music, conducted the orchestra and played keyboards. Then Boz was down on the forestage again, tougher and sexier than before, singing "I've Got Your Number," a song which epitomized the mood of stormy romance that seemed to have drawn everybody to the Paramount the night before New Year's Eve. The next afternoon I was waiting to talk to Boz backstage at the Paramount. He showed up about three-quarters of an hour late, walking rapidly, and immediately bent his steps in the direction of the pay phone and fished around in his pockets for change. Nothing. Quickly he turned and said, "Hey, got a dime I can borrow?" "Loan Me A Dime" is Boz's theme song, cut in Muscle Shoals, Alabama, in 1969 and featuring a session player named Duane Allman on the long jam. It has been fantastically popular for years in Boz's home territory. In 1975, San Francisco radio station KSAN-FM conducted a poll to find out what one record its listeners would want to have with them if stranded on a desert island, and the winner was "Loan Me a Dime." At the first four nights of the Paramount gig, nine out of ten calls from the audience were for that song. Boz never did it. About the time I handed him the money; well, two nickels actually; Boz realized what he'd just asked. "Funny," he murmured confidentially, and got on the phone. The interview would have to be continued later at the Scaggs residence in S.F. Scaggs' career has gone through a variety of stages: elementary teen rock with his schoolmate Steve Miller in Dallas and Madison, Wisconsin; folk and blues singing on the streets of Europe in the middle Sixties; a stint with the psychedelic-era Steve Miller Band; then six albums on his own. As the Paramount gig showed, Boz has moved from being a guitarist who writes and sings in a country and blues vein to being an R&B vocalist who often sings without his guitar. These days he even writes most of his songs on the piano, rather than on guitar, a change that allows him to move around more onstage. It hasn't been easy. At first, around the time of Slow Dancer, he seemed helpless without his guitar as a shield, and on several ballads he cradled the instrument without ever playing it. And, just as his stringy hair, golf shirts and casual slacks have given way to the blow-dry "Gentlemen's Quarterly" look, he has learned to relax onstage, roaming from one side to the other, conducting horn passages with dramatic thrusts or gentle waves of his arms, dedicating songs to "the beautiful young ladies" who buy up entire rows at the Paramount. Among the people he most admires for showmanship and "believable movement," he says is Bruce Springsteen, whom Boz joined onstage in New Orleans last year, and who, as it happened, was in the Bay Area for the holidays. He attended the New Year's Eve show and post-concert party in San Francisco photographer's studios. The party, for family and some 150 friends (including all the Tubes, who'd just finished their own New Year's Eve concerts), could well have taken place at the Scaggs' own new house across town, in the Pacific Heights neighborhood. But the house, formerly a foreign consulate, is in no shape for company. In fact, for 14 months Boz and Carmella, his wife of four years, have been working on remodeling the building into their particular vision of what elegant homebodies should call home. It is a four-story building, roomy enough to have both a front and a back staircase, a library, some large entertaining rooms, a couple of guest rooms and a fourth-floor music study. It must have been a gamble to buy the house before Silk Degrees came out. At that time, Slow Dancer had done well, and would eventually sell 250,000 copies, which was respectable but hardly enriching. Serious attention has been paid to the pleasures of the hearth, starting with the kitchen with its no-fooling-around restaurant oven and refrigerator. Just a week or two back, Boz had been putting the kitchen to intensive use as he made up quantities of Italian pesto sauce as Christmas gifts for various people at Columbia, where he has maintained personal relationships over the years - and set some sort of record for actually attending record company conventions. In the process he became a favorite with the company. Boz led the way to one of the more completed rooms, a high-ceilinged living room, converted from a basement, where we talked about his musical development. "I've become more proficient as a singer," Boz observed in a thoughtful, tentative tone, "and as my areas of musical involvement have expanded I've tried to use them all. That could account for my development. I've been pretty true to my musical interests as they have unfolded. "My first album on my own, that I recorded on Atlantic in 1969 (it was recently reissued), we went down to Muscle Shoals, which at the time was not a very common thing for white artists to do. There have been various taboos over the years, like you don't use strings and so on, but I've never felt limited by them. "I came to San Francisco in 1967 as a complete outsider. I had just come to work with my friends in the Steve Miller Band, and I consider them bright, broad-minded, progressive intellects. We took a giant step in recording Steve's first album in London, with Glyn Johns as coproducer. If it had come to that, we wouldn't have hesitated to use an orchestra." There were those who disapproved of any deviation from the Beatles/Stones guitar band pattern of the mid-Sixties, but Boz walked his own path. That path eventually veered more and more in the direction of the dramatic soul ballads associated with the Philadelphia writing team of Kenny Gamble and Leon Huff. And while Boz was playing the local club circuit in San Francisco with a guitar band, he was aiming for the polish of the pop mainstream. "At the time I was known in west, primarily in San Francisco. I was not national. I thought it was important to be successful: financially and in terms of prestige to my peers and for the sake of record company support. Not that Columbia wasn't supportive, but I felt I had to deserve that support. "I wanted a firm foothold in the mainstream, and to me Roy Halee represented a high degree of commercial effectiveness. He'd done Blood, Sweat and Tears and Simon and Garfunkel. Halee was accustomed to getting top studio musicians. He taught me that there was another way to accomplish it. Not just get together a band, but...there are studio musicians who already realize what I'm trying to do." By the time of his fifth album, "Slow Dancer", Boz was using studio musicians exclusively. And he made his first big move toward soul,employing Motown producer Johnny Bristol. "I wanted to move in a certain direction, and Johnny walked me through it. It meant a stronger vocal delivery, more the way I like to hear myself sing. It meant a different relationship to the material. With soul music you can't have lyrics that rely on subtle shadings or interpretations. It's got to be something you can deliver with conviction to a live audience." Deliver with conviction like "Loan Me a Dime"? "That's singing in a different vein, in that old blues vein. We start out higher now, at a more obvious, higher energy level and groove. 'Loan Me a Dime' is hard to get into and out of; it's distracting in the overall concept of a set. I'm trying to do it for my old fans, but only a taste of it, two or three minutes. "All my albums are experiments in some way. For Silk Degrees I took Joe Wissert for a producer - he produced Helen Reddy and a lot of pop mainstream people. We had a conception, like if we needed a bright, upbeat song at this place in the album, I'd write one. "I catch pieces of songs all the time, but I don't usually put them together until I'm going into the studio. I keep notes, drunken images and things. I have this box full of bits of paper, cocktail napkin scribblings, bits of wisdom. I always look through it before I do an album. In fact, 'silk degrees' was a phrase I'd had around in that box for a long time. Originally I was going to use that name for my second album (Moments). "For Silk Degrees, I sat down the weekend before the sessions with Dave Paich (arranger for the album) and we came up with about three songs. The rest were just skeletons when I got to the studio. The only song I had completely written before I went down to L.A. was 'Harbor Lights.'" When he recorded Silk Degrees, Boz had been without a manager for most of his career, negotiating all business - even producing his own tours and most of the Paramount shows - by himself. He finally found a manager in Irving Azoff, whose stable, outside of Boz, consists of the Eagles, Minnie Riperton and Dan Fogelberg. The last two are also on Columbia, and Azoff already had his own contacts at the label. Within ten days of Silk Degrees' release, Azoff put together the big tour where Boz headlined the first time in places like New York City and Atlanta, and the in July and August took him back for a second pass at the same localities on more exalted gigs. Despite the new era of heavy touring, the new aggressiveness which has put Boz on the same bill with the Beach Boys and Elton John, there is also something very low-key about the Scaggs-Azoff association; there wasn't a followup tour to the September chart successes, for instance. 'I didn't feel the need," Azoff had said. "Boz is going to be around a long time." "When I did Silk Degrees," said Boz, pulling a sweater around him as the room turned chilly in the fading afternoon, "I had been a critical success, but the sales didn't equal the critical acclaim. This meant that I was not able to tour extensively and give audiences the shows I wanted. I wanted a more intelligent approach and one with more foresight in terms of timing, logistics and production. You might say I had doubts about my career and where I was going, there in '74, '75. "Now I feel confident and comfortable in the L.A. studios. The best musicians are available to me, this vast selection to accomplish the music I want. "I'm like a kid in a toy shop," he said with a smile. "Or maybe a bull in a china closet." At the Paramount the crowds had been dressier every night as it got closer to New Year's Eve. As usual with the Scaggs Paramount shows, the poster presiding over the entry to the theater featured a stylish photo of Carmella Scaggs. Boz had said one reason he wanted to have a live string orchestra for this gig rather than the synthesizer, outside of the warmer tone of strings, was the excitement. He figured the audience could sense the confusion and running around backstage. Here were percussionists carrying exotic sound makers, and tuxedoed trombonists, and a pair of virginal blond cellists in black dresses clutching sheet music and adjusting their corsages, with stagehands dodging all around them. On New Year's Eve the show opened as it had each night, with a 16-man jazz band playing classic Swing Era arrangements of standards like "Take the 'A' Train" and Count Basie's theme, "Kid from Red Bank." An announcement before the curtains rose linked the music (which the audience might otherwise have associated more with the Tonight Show orchestra) to the Paramount and its now-fashionable Thirties decor. For all anybody knows, the audience might have been getting a foretaste of one of Boz's new musical directions. His interest in swing is recent, dating in some senses only as far back as a series of Pacific Film Archive screenings in Berkeley last fall of the John Baker Collection of jazz films. With the images of the old-time jazz performers before you on the screen, Boz had said, "You felt you could touch what was going on in the Forties or Thirties or Fifties, a direct line between musicians then and the present moment." He had plunged into swing with the plans for the Paramount shows. The original notion was to make the entire first half jazz. He'd considered getting a woman jazz vocalist to perform, a stab at his long-held vision of a revue in which he would appear periodically rather than throughout the show. He had thought of singing some old Billy Strayhorn compositions himself in order to demonstrate their contemporaneity. In the end, the idea fell victim to a combination of lack of time and holiday madness, and the band only did four jazz standards on its own before falling back to accompany Boz in some of his familiar numbers. The second half of the show, with its dramatic sequence of 'Dancer' and 'Degrees' numbers, couldn't fail - specially on New Year's Eve. And when the final notes of the second encore, "We're All Alone," were followed by Big Ben tolling 12 and a tape of Times Square at midnight, and the dropping of five sacks of balloons on the audience, things were bound to get delirious. This time not one but several young women got up on the stage and handed Boz roses. One slipped a gray top hat on his head. Things were looking good. In a couple of weeks, Boz would be recording another album. In April he and Carmella expect to join the New Baby Boom. And their house will be finished yet. Looking back, 1976 hadn't been a bad year. Not bad at all.